This DVD is instructed by UK-based healer James Philip. In his brief introduction, he explains that he is always being asked for short meditations that can be used daily, which lead to the creation of these routines. There are six, approximately 10-minute mediations listed on the Main Menu as follows: Energising – Abundance – Creativity – Rapid Rebalancing – Relaxation or Sleep (the menu also includes Audio Setup and Credits). I have provided a brief description (and time in parenthesis) for each practice below. Energising (10:54)—Philip starts here with a focus on the breath, moving to a focus on light as energy. He includes a forest visualization and ends with waterfall imagery. Abundance (9:26)—Philip notes that a wish for abundance can be either around a general or specific issue; he focuses this practice on abundance in health, wealth, and love. Creativity (11:06)—This routine begins with allowing white light to enter the body. Philip guides a visualization through nature and ends with the imagining of wearing a hood/cloak of green light. Rapid Rebalancing (8:29)—This shortest sequence is designed to be used at the end of a stressful or tiring day. The focus is on breathing light into the heart while breathing out through the belly and the extremities. Stress Release (10:35)—In this routine, Philip also incorporates breathing in while light while letting go on the exhale. In addition, he uses a metaphor of a tree in nature. Relaxation or Sleep (10:46)—In this final sequence, Philips focuses on deep, relaxing breaths. He includes gratitude via being grateful for one thing about the body, one material thing, and one thing that happened today. Overall, I enjoyed these practices. They were definitely both grounding and relaxing, and the short lengths made it easy for me to fit them in on a daily basis. I also liked that the routines had different themes, although I did not find these to be very distinct—i.e., the practices were similar enough that they began to blur together after I had done several. 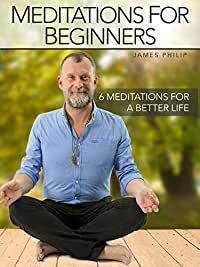 This is a fairly minor issue, as I would still recommend Meditation for Beginners as offering an very good selection of quick guided meditations appropriate for beginners and beyond.